Composed by MICHAEL RICCIARDI AND JOHN D. NUGENT. Arranged by JOHN D. NUGENT. Broadway, Musicals. Piano Reduction, Score. 392 pages. Published by Creative Horizons Music Publishers (ASCAP) (S0.218457). 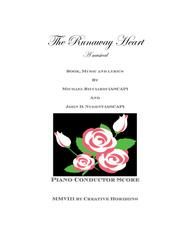 THE COMPLETE PIANO REDUCTION MUSICAL SCORE. IN THIS BROADWAY OPTIONED MUSICAL COMEDY, JENNY LANCER IS A YOUNG PRETTY GIRL LIVING IN A SMALL GEORGIA TOWN. POOR JENNY CAN NOT MAKE A COMMITMENT AND CAN'T TELL THE TRUTH. WHEN OUR STORY BEGINS, WE LEARN SHE HAS JUST BOLTED FROM HER SIXTH WEDDING IN LESS THAN FIVE YEARS. IN THIS ONE, SHE HAS FAKED HER OWN KIDNAPPING. WATCHING ALL OF THIS CRAZINESS IS PROFESSOR FATE AND PROFESSOR TIME WHO BECOME CONVINCED THAT YOUNG JENNY IS GOING TO RUIN THEIR REPUTATION FOR ALL TIME TO COME AND THEY BOTH DECIDE TO TEACH THIS GIRL A LESSON SHE WON'T SOON FORGET. THEY GIVE HER AN OFFER, SHE'D BE CRAZY TO REFUSE, THEY DICTATE THAT SHE MUST JOURNEY IN TIME AND FACE ALL OF THE BRIDEGROOMS SHE HAS LEFT AT THE ALTAR. THESE GROOMS HAVE MOSTLY GOTTEN A LITTLE NEUROTIC AND CRAZED AS A DIR*E*CT RESULT OF BEING DUMPED IN THIS MANNER. JENNY MUST CHOOSE ONE OF THESE GROOMS AND MARRY THEM. HER CURRENT GROOM, MICHAEL STILL LOVES HER AND IT IS HE (AFTER ANY ADVENTURES) THAT SHE FINALLY CHOOSES.